Dentists and other oral healthcare providers can end up spending an excessive amount of time managing their finances when they’d rather be caring for their patients. 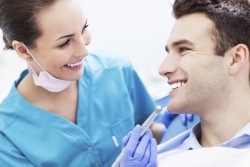 At Siebert & Reynolds CPAs, we supply dental accounting services that offer you the freedom to focus on meeting with patients and running your practice. As a Columbus, OH CPA that works in partnership with family dentists, orthodontists, oral surgeons, and other dental professionals, we have a keen and experienced understanding of the financial challenges you face. We can take over your bookkeeping, manage cash flow, handle tax planning, and deliver organized financial reports that provide a quick and accurate picture of your financial activity. We’ll also reduce tax obligations for your dental practice through proactive planning that ensure you’re utilizing all available deductions and tax breaks. No matter what accounting and tax services we’re providing, we deliver it all with friendly, responsive, customer service you can count on. Please visit our Dental CPA Accounting website for more information. If you'd like to start working with a local CPA that truly understands the needs of your industry, call Siebert & Reynolds CPAs at 614-367-7850 today to schedule a free consultation for your dental practice.